Customers love offers and discounts. The restaurant owners I talk to aren’t so sure. Are discounts a great way to build your business or do they simply devalue your service and food? Experience has taught me that a discount can be a powerful tool for increasing your profit, but only if it is used effectively. As with so many things, there is a trick to getting a good deal – for you as well as the customer. Restaurants use discounts to get bookings and orders. You may not like it but it’s the world we live in. Do we ignore them or do we join them? A small number of restaurants with very well-known brands can afford to ignore discounts. For the rest of us, not offering any discounts would mean missing out on business. The goal of marketing is to get more business. Equally, you don’t want to devalue your brand or your profits. So how do you manage both issues effectively? Use deals to recruit new customers, reward existing ones for their loyalty and to encourage particular customer behaviour (i.e. dine with you at slow times of the day, week or year). Every offer should have a purpose which can be measured. Offering discounts, outside of some kind of deal, kills your profits. Your brand is how your customers know you. If you over discount your prices, customers may discount your food and service too. Offer deals occasionally, but be clear about why you are doing it (i.e. 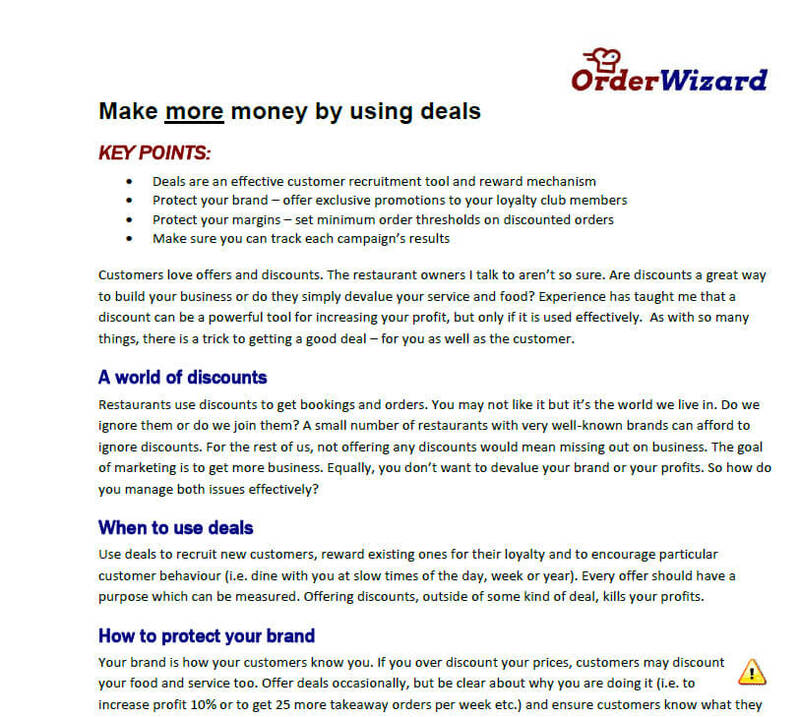 to increase profit 10% or to get 25 more takeaway orders per week etc.) and ensure customers know what they need to do to qualify for the deal. This approach helps existing customers feel wanted by recognising the value of their custom and it doesn’t devalue your brand. Naturally, emails from you to your Gold Club members are more personal and much more effective. This is quite different to third party voucher schemes that promote price exclusively and demote your restaurant to simply being a commodity supplier of food. Use your Gold Club customer list to target specific customer groups with relevant deals. This gives you the best chance of re-enforcing your brands value in the mind of the customer. Using deals occasionally and in a smart and targeted way also helps protect your margins because you are not over using them. Also, keep the discount in your deals modest. Does a 20% offer pull in more customers than a 10% one? In my experience, not much. As a result, you are much better off with a 10% discount and keeping the extra margin. But you can do better than that. By setting a threshold on your offer, the overall deal can actually improve your gross profit. This is how it works. If your average order value is £30, set the threshold for a 10% offer at £35. Customers know they need to meet the threshold and will in practice exceed in it by a few pounds. A typical £38 order with a 10% discount becomes £34.20, which significantly above your undiscounted £30 average. You may not get as many people taking up the deal, but those who do will be adding to your profits. Promote your restaurant the smart way. Any deals you offer should be targeted and designed to protect your brand and margins. All promotions should be branded to your restaurant, unlike most other third party marketing. And don’t forget, email allows you to monitor the results of each campaign, so you know you are getting a good return on your investment.